We left Vermont a little bit later this year due to a conference I was helping out with. This made Craig nervous, as snow was in the forecast. On November 12, we started our 7 day road trip to Denver to spend Thanksgiving with Warren (Craig's son) and Allison (his wife) before venturing further to the Southwest again. As expected at this late date, it snowed. We watched the weather forecast closely, and were finally past St. Louis when we felt the snow was behind us. Craig even used the snow to keep the windshields clear. Or the $300 a shot fill ups. averaged a little better than 8 miles to the gallon. We averaged around 350 miles a day, pulled off the road before 5 to avoid rush hour and get an early dinner. Thanks to our redundant services for Internet, I got a good day's work in while Craig drove. We spent our nights in truck stops or Walmarts, nestled in amongst the trucks. Waking up to the hum of the refrigerator trucks. It looked like we were on schedule to make it to Denver in 7 days, until we got to Kansas. Craig quickly pulled off I-70 about a half hour past Topeka. I continue to marvel at how in tune he is with his engine - constantly listening to make sure it is humming along as expected and watching the MANY gauges that come with the Bluebird. I figured something was wrong when he pulled over, and sure enough it was. The engine heat gauge had risen to 200 degrees. We made it to a truck stop in a little town called Maple Hill, Kansas. What appeared to be pin holes in the neck of the radiator were spewing out fluids. Craig went to work troubleshooting, while I looked up truck and bus repair services. The closest ones were back in Topeka about 25 miles back. 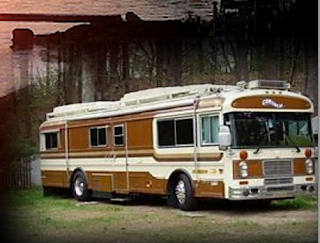 All throughout, Craig was posting updates to his WanderLodge Owners Group (also, known as WOG). By the end of the day Friday, we had an appointment for the following week at Holt's truck stop back in Topeka. The big question was how to get it there. Even though we have Coach.Net Roadside Assistance, Craig was really hoping to avoid getting the bus towed. 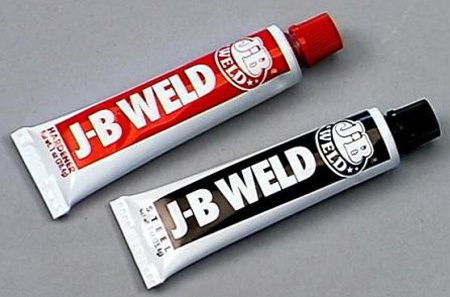 The next morning, he ran into town and picked up JB Weld. After carefully applying it to the radiator neck, we had at least 4 hours to wait for it to cure, so I started to look for distractions in Topeka. 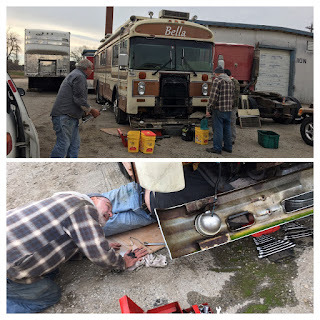 After enjoying some great music, meeting some wonderful folks at the makerspace, and indulging in Kansas BBQ, Brownies, and Beer, we returned to the bus to make a plan for getting the bus to Holt's truck repair. But thanks to the AMAZING Wanderlodge community, a different plan unfolded. Craig had received a few different responses to his post on the Wanderlodge User's Group including one from Bob who offered to bring his tools and help. Bob was a fairly new Bluebird owner who lived about 45 minutes away. Craig and Bob corresponded by email and phone and tried a few things. They made a plan to meet up in Topeka. Craig crossed his fingers that the JB Weld would provide enough of a temporary solution to drive the bus back to Topeka. Well, we didn't make it very far before the bus hit 200 degrees again. More troubleshooting! More conversations back and forth with Bob and before we knew it, Bob and his Bluebird joined us. The two BlueBirds hobbled over towards Topeka. Two miles! Troubleshooting! Add Water! Cool the engine! Try again! Two more miles! Again 200 degrees and Steam! Pull over! Cool Down! Troubleshoot! Add Water! and try again! Meanwhile, Tim, another BlueBird owner reached out and offered to help. He had a shop in Topeka and space for the bus to park. WOW! And just in case we needed another sign that we should take Tim up on his offer to help, a car pulled up in front of us during one of our 'Cool Down' periods on the side of the road. The woman quickly jumped out of the car and introduced herself as Natalie - Tim's wife! "When I saw two Bluebirds pulled over the side of the road, I figured this has got to be the folks Tim has been talking, too." What's better than two Bluebird owners troubleshooting? THREE Bluebird owners, of course! Natalie gave us more detailed directions on how to find Tim's shop (which was about 13 miles away) and we continued to hobble over a couple miles at a time. There was definitely plenty of room for both BlueBirds! put their heads together and started to work out a plan. Tim even offered us a place to plug in! The 30 amps was very welcomed on this cold Kansas night (about 20 degrees). After everyone went home for the night with a plan to continue in the morning, Craig and I decided to go find a place to breathe a sigh of relief and give thanks for the incredible support we were receiving from the WOG community! Tim, Craig, and Bob met early Monday morning and worked most of the day on removing the radiator and continued to troubleshoot. Thermostats were boiled, new parts were fabricated, theories of what had triggered this radiator event were debated. It was amazing to watch. All I kept thinking was HOW frickin smart these guys were. Watching their passion, their knowledge, their camaraderie was totally amazing! By afternoon, Craig and I were driving the radiator to Kansas City to a Orr's Radiator Shop, where it would obviously spend a few days. Since Thanksgiving week is a short work week, we were crossing our fingers and hoping for some news right after Thanksgiving. Tim was the most amazing host. I can't believe how blessed we were to enjoy his shop as a place to break down, troubleshoot, and plan our next steps. A safe place to park! Tools! Fabrication shop next door! 30 amps to keep us from freezing! A warm fire in the shop! Tim even offered up a washing machine in his shop to catchup up on laundry. But more than anything was the unbelievable knowledge, resourcefulness, skill, and spirit that surrounded us. We were so so blessed and are so so thankful! On Tuesday morning, we left the bus behind and jumped into to the Jeep on an 8 hour road trip heading to Broomfield, Colorado (just outside Denver/Boulder). About half way to Colorado.. this happened! You've got to be kidding! Another radiator having a hissy fit! Again we hobbled off to the nearest exit. It felt a little like the movie Ground Hog day. We hobbled about a half a mile at a time. Cool the Engine! Repeat! We landed in a little town called Oakley. I'm talking real LITTLE! But again our unfortunate event, was followed by good fortune and we found a small town mechanic named Kenny who was knowledgeable about Jeeps and who went right to work on the problem. Kenny changed out the thermostat and that helped a bit, but not enough to give us the confidence we needed to keep driving towards Denver. The radiator was again suspect. After some debate about best options, we decided to leave the Jeep with Kenney for him to work on after the Thanksgiving break. And again our good fortunate was with us that there was a local small town auto dealer with ONE car to rent - a 2016 snow white Jeep. Once again we hit the road traveling west passing the glow of the windmills shining in the night. Four hours later, Craig and I and the cooler filled with Vermont Heady Topper beer and Citizen Cider arrived at Allison and Warren's house in Broomfield, Colorado. With a big sigh of relief, after an intense few days, we gave thanks that we had made to Colorado in time for Thanksgiving with family. than when it less Vermont. Is there room in the fridge? Gotta keep those cans the right temp!